Enlarge View 8 images in sequence. - Vol. 1, no. 1 (Oct. 28, 1942)-v. 3, no. 91 (Sept. 15, 1945). - Collected in Japanese camp papers. - Available on microfilm from the Colorado Historical Society and the Library of Congress, Photoduplication Service. - Published at the Granada Relocation Center established by the War Relocation Authority. Granada Pioneer . 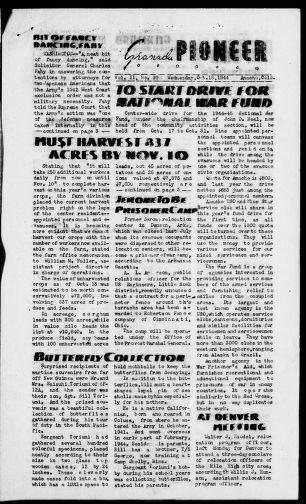 (Amache, CO), Oct. 18 1944. https://0-www.loc.gov.oasys.lib.oxy.edu/item/sn83025522/1944-10-18/ed-1/. (1944, October 18) Granada Pioneer . Retrieved from the Library of Congress, https://0-www.loc.gov.oasys.lib.oxy.edu/item/sn83025522/1944-10-18/ed-1/. Granada Pioneer . (Amache, CO) 18 Oct. 1944. Retrieved from the Library of Congress, www.loc.gov/item/sn83025522/1944-10-18/ed-1/. Water tower and grain elevator in Granada, in southeastern Colorado 1 photograph : digital, tiff file, color. The Masonic Lodge building and adjacent body shop in the town of Granada in Prowers County, ... 1 photograph : digital, tiff file, color.